Step 1 Whisk together the vinegar and 2 tablespoons of olive oil. Add the garlic to the mixture. Step 2 Place the steak in a shallow dish and pour the marinade over the top. Let it sit for 10 minutes. Step 3Meanwhile, heat the stove-top grill or broiler. Slice the bread about 1/3 inch thick. Brush it with the remaining olive oil. Slice the cherry tomatoes in half. Step 4Remove the steak from the marinade and season with salt and pepper to taste. Grill the steak about 2 to 4 minutes each side for medium-rare, depending on the thickness of the steak. Remove to a cutting board, cover with foil and let rest. Step 5Grill the bread on each side until brown and crisp, about 1 minute. Slice the steak on an angle, against the grain, about 1/4 inch thick. Step 6Place 1 or 2 slices of bread on each plate. Top with slices of steak. Place about 1/2 cup of arugula on the steak. With a vegetable peeler, shave some cheese onto the arugula. Scatter some tomatoes around each plate. Drizzle with some olive oil and grind some black pepper over all. In Recipes-list.com we have selected the most viewed recipes from category - Grilled Main courses Quick and easy . Enjoy the best recipes specially selected for you! 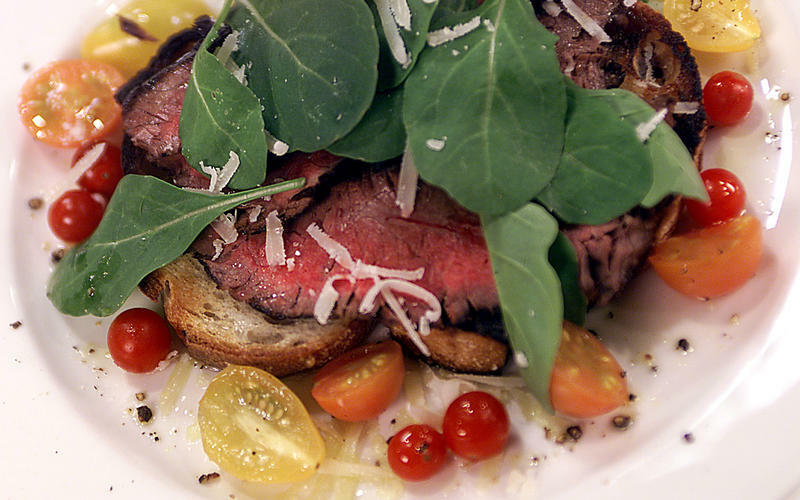 Balsamic-Grilled Flank SteakWith Arugula and Cherry Tomatoes is the right choice that will satisfy all your claims.